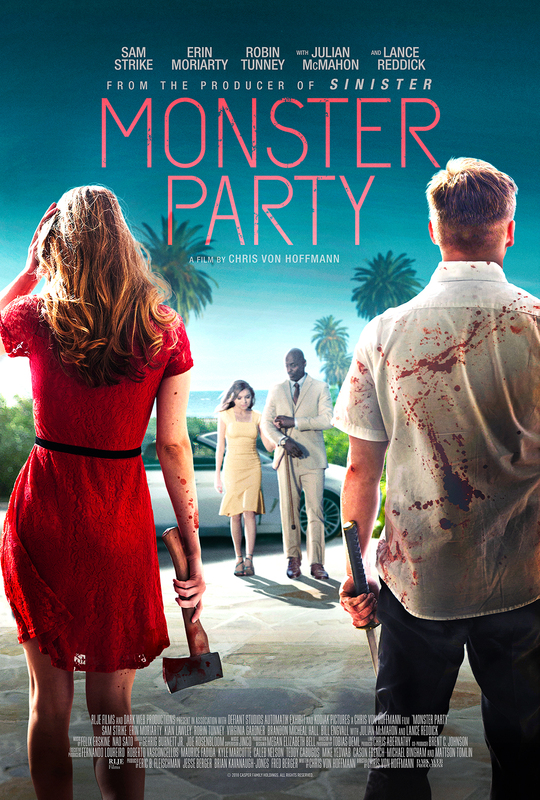 Monster Party, just released from RLJE films, is a new film from Chris von Hoffmann, director of last year's Cannibal horror flick, Drifter. The premise for the film instantly grabbed me and the prospect of seeing Robin Tunney again made it even more enticing. Monster Party starts out with a group of teens (Casper, Iris and Dodge) breaking into and robbing a house. We soon learn that Casper (Sam Strike), needs a large amount of money to save his father from being killed over gambling debts. Iris (Virginia Gardner) mentions that she is going to be working as a caterer for a rich family's party, so the three decide that they will use this opportunity to rob the house to bail out Casper's dad. We soon learn that the homeowners are not your average family and the guests are far more dangerous than the three young thieves. Oh, and if that's not enough, wait until you see what is in the basement! Monster Party was a gory, flashy thriller with some blacker than black humor thrown in for good measure. The premise is very original and well crafted, with enough spraying blood and faces ripping off to satisfy horror buffs. A few of the peripheral characters could have been cut out with more focus on the leads, but overall it was a blast. I liked the cast a lot too, especially Tunney, Sam Strike (fresh off last year's Leatherface) and Julian McMahon. An overall fun film filled with shocks, gore and humor. 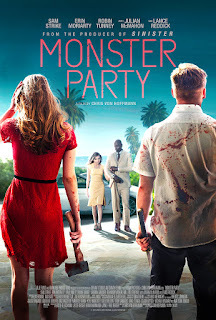 Monster Party is available now to stream or purchase digitally, as well as Pre Order the Blu Ray and DVD versions (which will be released on December 18, 2018) HERE.